I got the Android Pay update. None of my cards are supported directly. One is supported through another bank via a translated card number, but it's an affinity/reward card, so that would defeat part of that by putting in effectively an obfuscation layer. These aren't small bank cards, either. These are top 10 banks, all of them. So it looks like Google isn't really ready to launch this properly. I set mine up today, as well. Oddly, my US Bank Debit card worked perfectly, and I could verify it myself. My US Bank Credit card, however, requires me to dial a 1-800 number. Which I'm unwilling to do. Is there a Google-cloud app for note-taking? When my last phone died unexpectedly, I lost all of my notes. I've always used Google Docs. Probably not as quick as what you're looking for, though. Pocket might be able to do what you're looking for...? Being from a country that went contactless very fast (we use contactless cards, but mobile is basically the same technology in a phone), it does have some very nice advantages. If you pay small amounts, you get cleared instantly (no PIN, no signing receipts) and even when authorization is needed, it's still faster than swiping a card. With mobile, you can pre-authorize your payments while waiting in line, saving still more time. The retail chains here that adopted contactless payments have, in general, shorter waiting times at the counter. You collect your goods, you beep and you're done. Very fast. Keep, Evernote, MS OneNote etc... While not all google cloud - all are cloudbased. While not technically a note taking app - it can function as one and is pretty cool is Microsoft's Sway. While I posted about Keep above, I personally use OneNote because it seems to also work best for work note taking on PC for me, and having it all using one app is handy. I hadn't posted about it because he asked about Google Cloud. Rereading, maybe he was asking more generally. Yeah I'm a big fan of OneNote as well especially since I use a Surface Pro 3 quite a bit and it supports the Surface Pen incredibly well. The Android app for OneNote has actually become quite good as well. You read me right. All my contacts, email, calendar, yadda yadda is with Google. I don't need much from a note app, so I'd prefer theirs. I'm going to download Keep right now and give it a shot. Thanks! The wife and I have been using a Keep checklist I shared to her as a daily HoneyDo list. It's way easier than scrolling through a day's worth of texts to find everything I'm supposed to grab at the store. Worth the install just for that. I was finally able to convince my wife to go paperless and use Google agenda for everything. But we're running into a few issues. We agreed to different scheduling colours for different event types, but those don't transfer when I invite her or vice versa. I haven't found anything in the settings that allows to simply copy the creator's color use. Another thing, and this might be an Android 6.0 bug, is that often when I click on my wife's invite the phone takes me to a browser-based screen instead of the Agenda app. Anyone have any suggestions for an agenda app that uses our Google Agenda data but has a bit more options? I have had Asana on my "maybe this will help us get more organized" short-list for a few months, but I keep forgetting to give it a deadline so that can keeps getting kicked further and further down the road. Trello is better. Much, much better. Asana is great for medium teams for projects that need to be broken down into granular tasks. Trello is a great to-do list. I always thought of giving Wunderlist a chance, but I've never gotten around to it. Right now, we create an appointment in our agendas and invite the other as participant. For events where one of us doesn't attend (say my wife's Crossfit training) the other hits 'maybe' so it turns up in both agendas. Problem is that the specific color scheme is not transferred across agendas. Is there a more efficient way to share Google agendas maybe, like for Outlook? Can't you just share Google calendars? My girlfriend and I do that and it's a godsend. Just color your spouse's calendar differently and you always know what's yours and what isn't. Yup. I honestly thought you had already shared and it just wasn't giving you enough nuance as to what is an FYI and what had an interaction or categorization from one of you attached. Create a calendar. Share and give edit rights, make sure it is selected as visible on all your devices. Only catch is you have to make sure you're creating new items in the right calendar. It took my wife 3 years to fully commit to e-scheduling, so it was mostly me sending invites for all my and our mutual appointments to her. Which is probably why I didn't think of the obvious solution. Yeah my wife and I do the same. This new update for Google Maps is wonderful. True offline functionality, offline maps now auto-update, and there is no limit to how big an individual offline area can be!! Mashable had this blurb about Letseebeer. Letsee Beer, created by Korean startup Letsee for iOS and Android, uses your smartphone camera to scan the labels and shapes of beer bottles and cans (no draught, though). It brings up the beer's basic info, plus hashtagged descriptions ranging from #fruity to #damntasty and reviews that other users have left to help you determine whether the brew is worth a try. Just got 6.0 on my LG G4. Audible doesn't seem to have the option to store books on the SD anymore? Is that a Marshmallow thing, or am I crazy to think that's how I had it set up before? I don't have the deepest experience with Marshmallow as my Nexus 6P doesn't have an SD card slot, and my Tab Pro 8.4 has an alpha version of Cyanogen on it. But with the tablet, there seems to be an issue with quite a few apps where the system loads the SD card via some type of emulation... not sure.... but it's been difficult getting apps to recognize that there is an SD card installed. Audible doesn't even show a setting option for changing storage now, when I thought it used to. I had some books on the phone, but they weren't showing in the app as downloaded after the upgrade. The system level app screen showed 2GB of media on the phone, but I wasn't able to access anything. I went ahead and wiped the app data and redownloaded a couple of books, but I really would rather use my SD for storage. All my other media apps were able to just get new permissions and use the SD. Yeah, like I said, I think Marshmallow is handling SD card mounting a little differently, so it's possible that apps will need to update to be able to see them correctly. 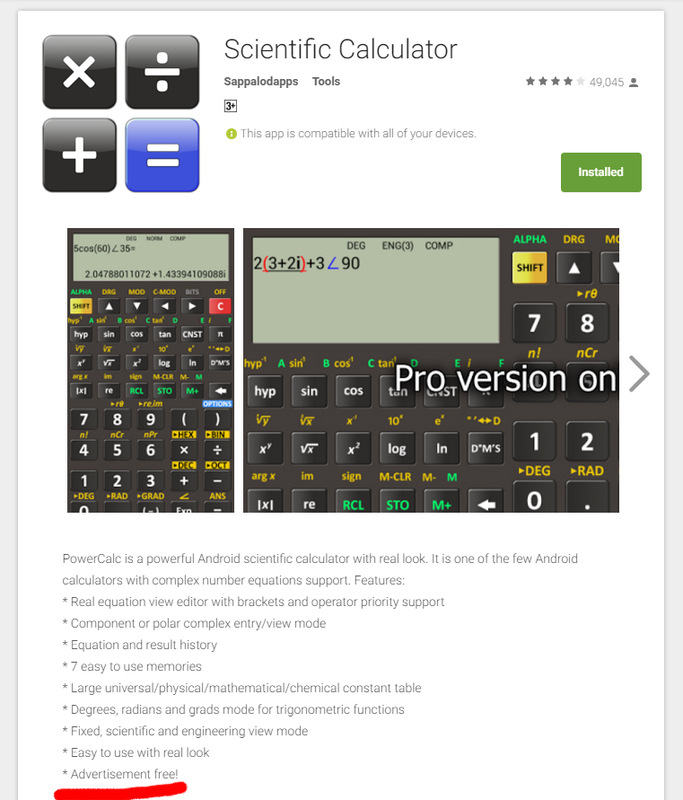 Wow, I just read this post about a crazy scientific calculator app on /r/android and it's pretty shocking. Disclaimer: I’m developing a competing application, Natural Scientific Calculator so I might be a little am biased. Nonetheless, all the following is factually correct and referenced for your convenience. So why would they request so many permissions? Believe it or not it gets EVEN worse. I decided to take a look at the legal disclaimer and this is what I found out. The Caller ID service is provided by a company that’s unfortunately but aptly named CIAmedia (not affiliated with the Central Intelligence Agency). I say aptly named, since they literally track who you call and harvest the entirety of your phone’s data, whether it be your location, or call logs to show you targeted ads! As a developer and a devoted user of Android this really disgusts me. The reason why I decided to develop Natural Scientific Calculator was because of the horrible state of calculator apps on Android. All of them had clunky one line displays, outdated Gingerbread-esque design and required users to navigate using buttons rather than touch. 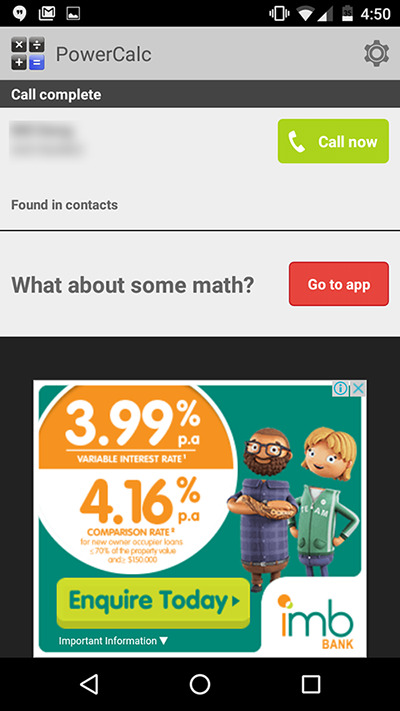 And to top it off, now one of the leading scientific calculator apps on the store is trying to mine our personal details to increase their revenue. I have a tip - maybe instead of trying to squeeze every last bit of personal information from your users to generate ad revenue, make a better scientific calculator that users will actually pay for. Now looking back, it seems like the phenomena of flashlight apps and their ridiculous requests for permissions were a sign of things to come. It’s clearly evident that the practice of requesting permissions to harvest user data is becoming increasingly widespread on the Android platform. 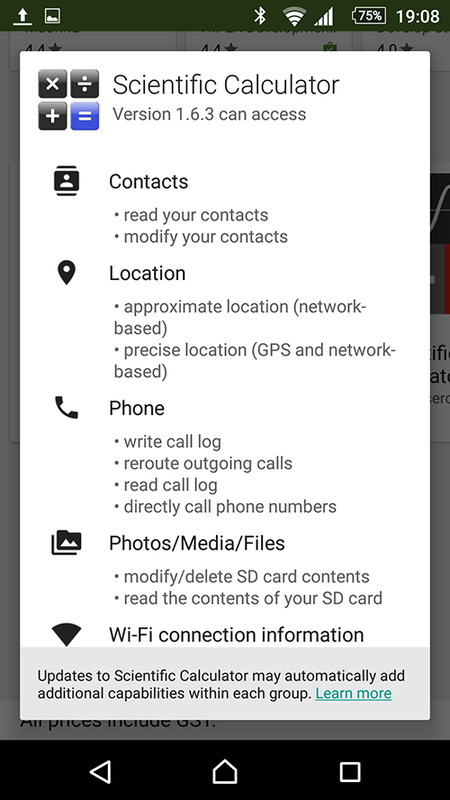 TL;DR: Leading scientific calculator app adds Caller ID feature to mine call history and GPS location to serve lucrative ads to users. EDIT 2: Okay, another major problem of Android is this. You know what allows apps to pull stuff like this? 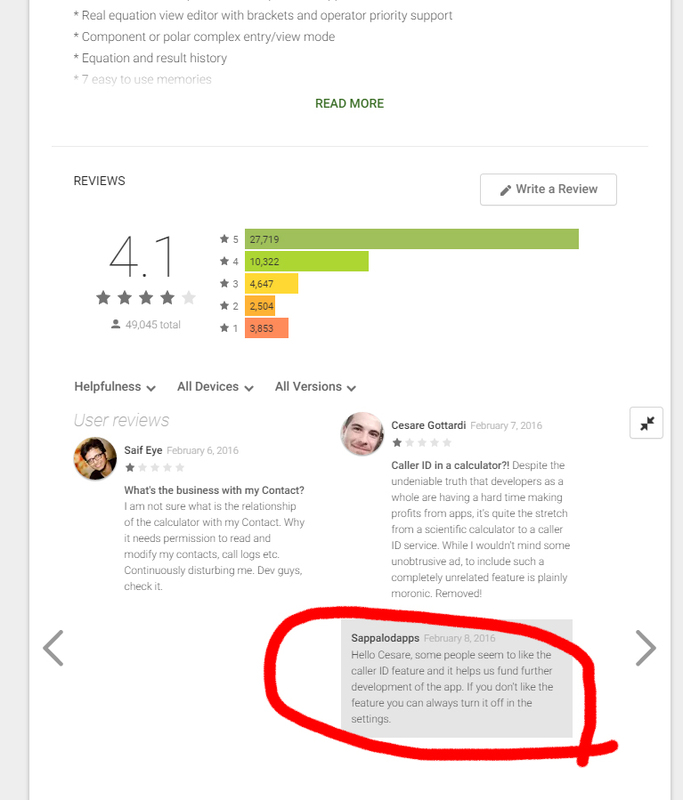 The lack of movement in the search results of the Play Store. Compared to the App Store, the volatility of rankings is virtually non-existent. That's why you end with the problem of apps misusing their position at the top of the search results - either by not updating their design/functionality (e.g. 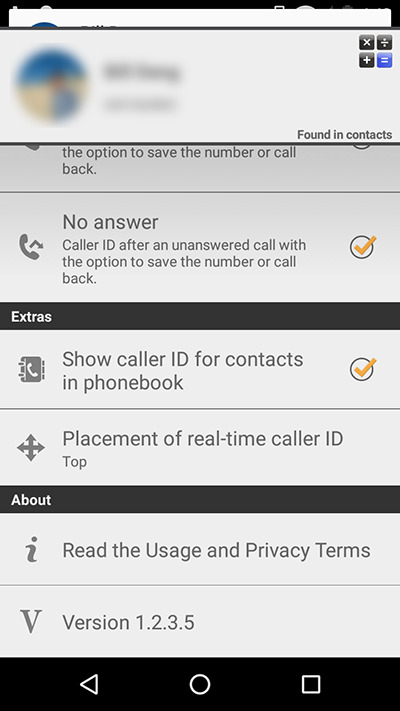 RealCalc) or by adding Caller ID to milk their users dry (e.g. Scientific Calculator by Sappalodapps). They can do this because their rankings don't get affected! They were there 3 or 4 years ago and they'll stay at the top of the search results, simply by virtue of getting there early, rather than being the best.